The first game of the 2016 Olympic Men’s Basketball tournament in Rio this summer takes place on Saturday and it should be an exciting match to start off with. 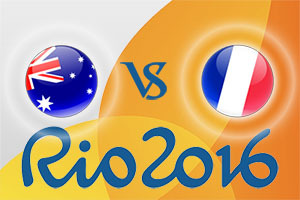 Australia and France are the two teams who are tipped to come in behind the United States in the group and the winner of this game will be confident of taking second place in the group. With the route to the final already in place depending on where you finish in your group, finish second is vital, and a lot rides on this game for both teams. The French can call on players like Tony Parker, Boris Diaw and Nando De Colo for this game, and it is easy to see why so many people are backing them to go far in this tournament. The Australians have players like Patty Mills, Andrew Bogut and Matthew Dellavedova, all of whom have plenty of NBA experience between them. This means we should see a high quality match to start the tournament, which will hopefully set the tone for the summer. With the French side being the third favourite for the tournament overall, it is no surprise to learn that the bookmakers are backing them in this game. You can back the French at -7, which is on offer at odds of 1.90. If you are looking to take the Over/Under market for this match, you will find that it is available at 150.5. For the opening game of the tournament, which is likely to be slightly cagey, we tip going UNDER 150.5, which you can find on offer at odds of 1.90. Bet Now! If you expect the French to take control of the game from the start, you can take a France-France bet, which means you expect France to lead at half-time and then win the game, which is available at odds of 1.68. For a turnaround result, with Australia leading at the break with the French coming back to win, you’ll find odds of 6.00, which is likely to entice a number of basketball fans with a small wager. This is the sort of bet to look out for to really maximise your interest in some of the lesser games during this tournament. This game starts at 18.15 BST on Saturday the 6th of August.